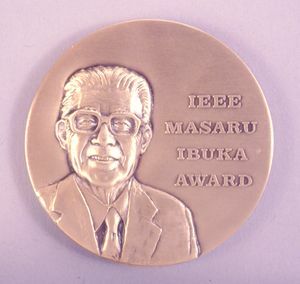 The IEEE Masaru Ibuka Consumer Electronics Award was established by the IEEE Board of Directors in 1987. The Award is named in honor of Dr. Masaru Ibuka, Honorary Chairman and Co-Founder of Sony Corporation, whose innovative achievements and leadership in state of the art and have been an inspiration to several generations of electrical, electronics, and computer engineers. This page was last edited on 22 April 2019, at 16:46.